I’m not a portrait photographer usually. Usually I spend my time creating images of inanimate objects, Architecture, products and landscapes. A close friend asked me to come up with something special when his kids gathered for fathers day this year. I made an image of each family group separately while standing in the yard of their cottage. Once I had an image of each group I removed the background so that just the people where left. Once that was done I could move the groupings on to any background I would like too. This is what I ended up doing. A few images from the start of the Westfield New York Wolverine fall sports including, volleyball, football, boys and girls soccer. Enjoy the slide show. Categories : Chautauqua N.Y., Local Sports and Event Photography, Location, Westfield N.Y. Image #1 taken during a night game at the high school with a Canon 7D, 70-200mm @ 200mm-at ISO 2500/ f2.8 @ 1/640 of a sec. 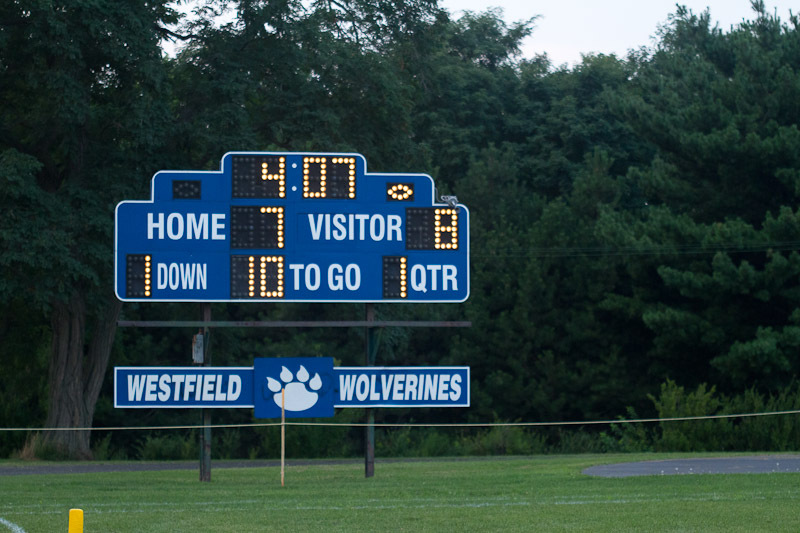 Image #2 is shot of the score board early in the game. Finished composite – Practicing with the pen tool some more. I removed the player mostly with the quick select tool with some help from the pen tool. 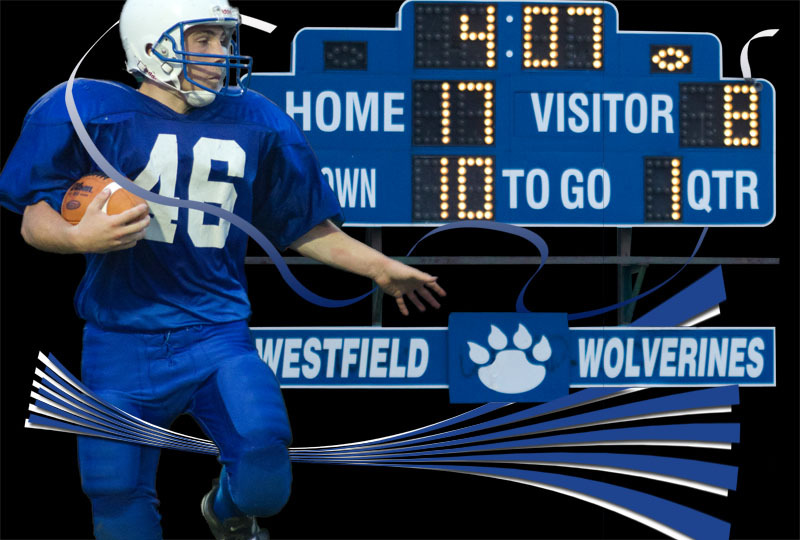 Them I cut out the score board using only the pen tool. Then just for fun I played a little bit with the pen tool and shapes in the form of the ribbon and the blue and white lines which started out as a set of parallel rectangular shape and then they were shaped with the warp function in PS5. The score was also changed in favor of the home team. Categories : Chautauqua County N.Y., Local Sports and Event Photography, Location, Location Portraiture, Photoshop Composite, Westfield N.Y.
A couple of images from the start of the 2011 Tour of Chautauqua Bicycle event in Westfield New York. A little bit of post processing to increase contrast, give the colors a little pop and a slight vignetting on the corners. Categories : Chautauqua County N.Y., Local Sports and Event Photography, Location, panorama, Tourism, Westfield N.Y. Practicing extracting elements from existing images and combining them with other images. I think the extraction looks pretty good. No color fringing on the edges etc. 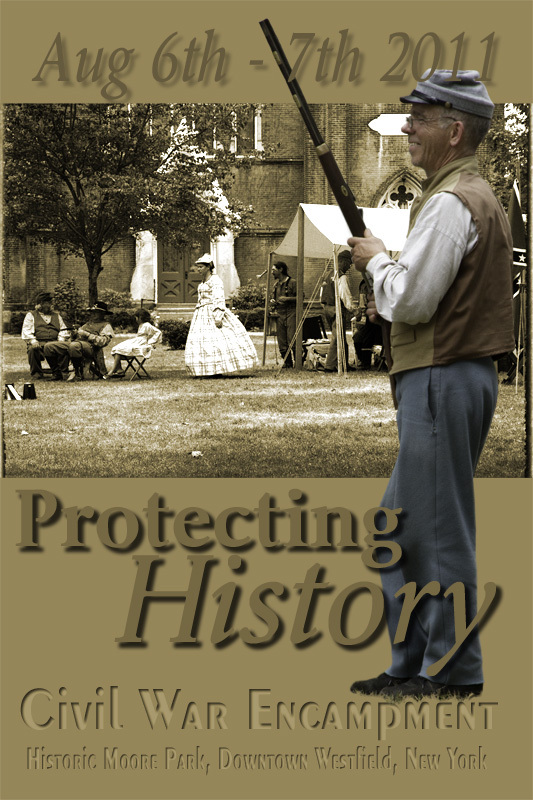 This is a mock ad for the civil war encampment that took place on Aug 6th and 7th. I’m not happy with the grin on the gun toting rebel, I think a sterner face would have worked better with the protecting theme but I am working with existing images and using what I have on hand. All the extracting, tone adjustments, B&W conversion and text where preformed in photoshop CS5. BMX races held in Ellery Center, N.Y. on Dutch Hallow Rd. up on the hill behind Bemus Point N.Y. The track was very photographer friendly.